Hi the measurements of this machine is W- 59 H- 85 D- is also 57 (I couldn’t move the machine out- but got the measure to the back) it’s s fantastic machine. I love it. Fits perfect into my standard space in between units. Hi, I would like to know how the machine deals with just a couple of items being washed. Say I just need a pair of jeans or a delicate top not a full load. Ive recieved my new machine today and first wash is taking forever its been hours in fact.. i used the eco cotton wash ..what does everyone recommend. Hey Jayne. I guess it all has to do with what kind of fabrics, colours etc you are washing. The cycle I use most is mixed. it takes 1hr 15 min with a range of temperatures I use 50 degrees or 60. Eco cycles generally tend to take longer on various appliances. Hello Jayne , I'm the same as Sarah I use the mixed wash and also change the temperature and spin etc to alternate to the needs of the wash .
wool = 40 min and delicates = 50 min. The Whirlpool FSCR 90430 Supreme Care Washing Machine in White runs at little more than a whisper thanks to our latest Zen technology, so a late night wash won't disturb your sleep. A powerful jet in the drum sprays directly onto your clothes saving water while offering the best rinse performance. 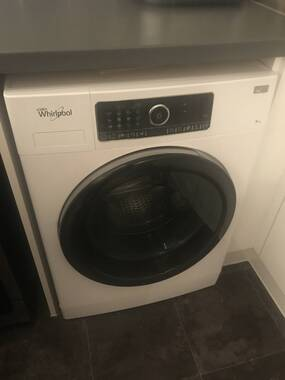 For your convenience this washing machine can tumble your clothes after every wash for up to 6 hours after the cycle ends, keeping your clothes smelling and feeling fresh if you aren't available to remove them immediately. A convenient 15 minute quick wash for 3kg of washing this machine is also perfect for the moments when you need clean clothes quickly as well as intensive rinse for those tough stains. With a dryer that matches this machine perfectly, it is the no.1 in fabric care providing a longer life for your clothes including delicate items. The Whirlpool FSCR 90430 Supreme Care Washing Machine with features for your convenience and a stylish finish to complete any kitchen.